You are here: Home / Visio Content / Shapes / Electrical & Electronic / DIP Switch Shapes Gone Wild! The problem with the internet is all that darned text you have to read, so let’s take a break today and watch TV! OK, You Can Read About Them Too! For those of you who can’t deal with sound right now, or who want to save a little bandwidth, here’s a quick summary of the shape variations. Visio Guy (*cough*) then got into the act, with the spirit of an impatient, keyboard-shortcut-using, command-line-missing, old school hack. While this approach is rather geeky, but it is probably the fastest method shown here, and lends itself well to automation via code, since only one ShapeSheet cell needs to be set, and that cell-setting code doesn’t need to much know about the shape, just about ON and OFF. Just Flip the Switches, DUH! He also used the ShapeSheet BOUND function to make sure that the switches snap crisply into place. You don’t have to worry about sliding them 75% of the way! 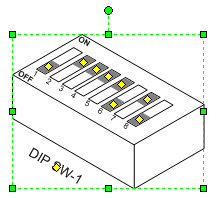 But Zhuravsky had more in store, and adapted his control handles to this nice, 3D, isometric view of a DIP switch. Very cool indeed! 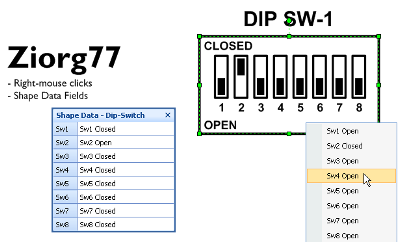 I would like to download this (Interactive DIP Switch Shape) but the link doesn’t work. All other downloads I’ve tried are fine. I’ve tried searching the site for alternate links, and they all give the same behavior. The download link goes to the Visio Guy forum, where the dipswitch shape can be downloaded in various incarnations. 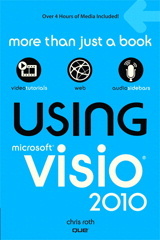 New to the site, but very impressed by Visio Guy’s animated mouth. Why not place the links right here so that it is as easy to GET the shapes as it seems it will be to use the shapes? You might want to read your post again, then think about what you’ve said. 1. 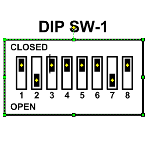 The shapes are inside of a forum, so users are continually adding new versions of the DIP switch. This makes it very time consuming to update links to each post that offers a download. 2. Since it’s a forum, you might be interested in what people have to say about their creations. 3. The forum has different login credentials than this blog, and requires membership even to see the download links. So listing them here would be pointless. 4. Sending people to the forum raises awareness that the forum exists. 5. Having to jump through a hoop or two to get something for free that would take hours or days to create by yourself is truly a first-world problem.